When are maximum SMSes sent out? In most cases it is during festivals like Diwali, Christmas, New year etc. wishing your family, friends and loved ones. Infact, in many cases the SMSes we send out during these 5-6 festivals combined are more than what we generally send through-out the year. And Mobile companies make moolah during these days – And how? By charging extra or “special rates” for SMSes specifically for those days. Generally, telecom operators lure the customers with very attractive SMS packages (like 1 paise per SMS etc), however during the days we expect to make full use of it, you end up paying much much more. However, looks like this time around consumers may not end up paying those hiked rates. Madras High Court has ordered 10 mobile companies to refrain from charging extra for SMSes during festivals and other important days based on a petition filed. It was filed by petitioner Arunachalam who sought an interim stay on undue and sudden hike on SMS charges! The Judge ordered notices to the TRAI chairperson and Zonal / Regional Managers of 10 companies namely, Bharti Airtel, Aircel, Vodafone, Reliance, Idea Cellular, Unitech, Tata Docomo, MTS mobile, BSNL mobile and Videocon. The case will go for further hearing on January 21 2012. I am glad that someone has stood up against these Mobile Companies and the timing of stay could not have been better. What ever the ruling in the court might be, the operators cannot charge extra till the decision is made! Having said that, I am sure that these mobile companies have covered themselves against such things by way of fine prints, that allows the company to change the rates as per their wishes! Would love to hear your comments on these! Vodafone Delhi , 31 Dec & 1st Jan . SMS being charged at Re. 1. Was this a genuine article ?? That’s good these companies which try to make customer fool should be punished. “This New year send unlimited SMS on 31st Dec and 1st Jan.
Standard rates applicable on these sms ………..” at the end they say “No free/discount sms”. 1- Why send this sms, repeatedly, all of a sudden when we all know that we can send unlimited sms any day. 2-Why didnt they start the msg saying ‘Please note that no free/discount sms applicable during 31st and 1st’, as they used to do earlier. This is very bad trick. One typically doesnt read complete msgs when it is not personal. Reading the first line it looks like it carries some +’ve news and we (atleast I) assume the rest. Yes, this happened with me for Diwali. On some busy day, I just saw that I can send unlimited msgs. Sent a bulk sms and got charged for each and every msg i sent. I disagree with the general consensus that operators should not hike SMS charges during festivals. 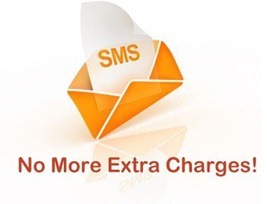 Look, the SMS service is provided by a private operator to the consumers at a charge. Depending upon capacity, demand, costs, & margins, an operator should be allowed to charge more during festivals. This will ensure proper market mechanism during heavy demand, otherwise consumers will not appreciate the fact that capacity/resources are limited, and should you require these scarce resources, then you must pay a higher amount to get them.